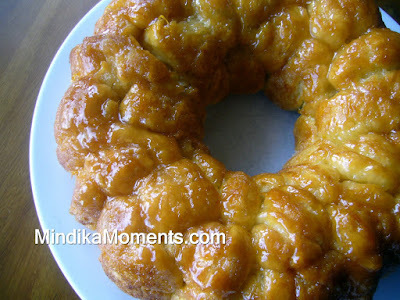 I've always been a fan of sticky buns, but I think I've been converted to this recipe instead. I found it on Grandma's Desserts and it looked so bright and tasty, I knew I had to try. I'm a sucker for anything citrus in desserts. All I have to say is...be ware...you could easily eat a whole pan all by yourself! Luckily or un-luckily, however you choose to look at it, I had to share with my family. So I didn't eat the whole pan...but I wanted to. On another note, I have a little tip for you about orange or lemon zest. Do you ever find yourself needing zest for a recipe but not juice, so you feel bad wasting the fruit? (or visa versa) When a recipe calls for one or the other, I take the other and freeze it for future use. i.e. this recipe calls for orange zest, so after I zest the orange, I'll juice it and freeze the juice in ice cube trays for my recipe that only call for juice. Also, when ever I or any member of my family eat an orange for pleasure, I zest it first and freeze the zest by wrapping small amounts in plastic wrap then putting into a larger freezer safe bag. It will stay fresh for up to 3 months. I love having zest on hand whenever you need it. I have this same recipe scheduled for next week! So I guess it doesn't matter what type of pan you use? Your bunt roll looks delicious! Thanks again! Seriously love love love your blog. Every recipe I try, I love! I like your new logo too...very fresh and bright.